I’ve been asked to do an “AMA” on the popular WordPress curated news site: ManageWP.org. I’m a big fan of the platform and get a lot of my own WordPress news directly there. They’ve done some great AMA’s with folks like Tom McFarlin, Rachel Carden, Josh Pollock, Pippin Williamson and more. I’ll be answering questions there from 2pm – 9pm (PDT) Wednesday October 26. UPDATE: The AMA is over, was a bunch of fun and hopefully useful to many as well. WPEngine’s TorqueMag did a nice summary of it here as well. 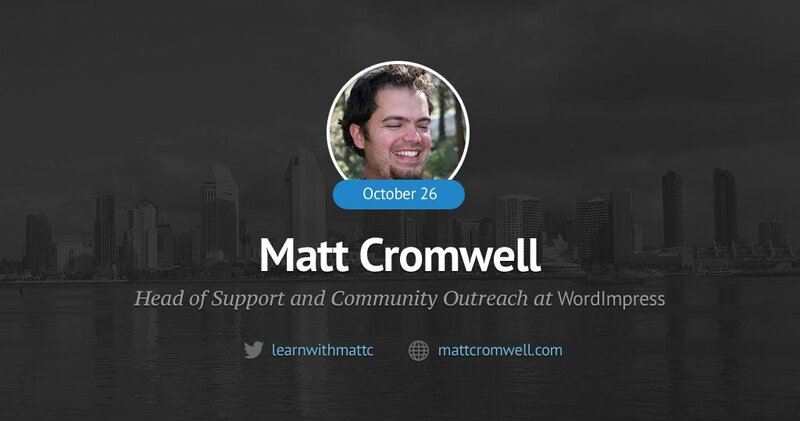 I’m Matt Cromwell, Head of Support at WordImpress.com. AMA! I’m Matt Cromwell, I have a wild and crazy job history and educational background that magically landed me at WordImpress  as Partner, Head of Support, co-author of the Give Donation Plugin , and more. I’m obnoxiously proud of the fact I began web development by building websites for churches with Notepad in pure HTML and CSS. My first exposure to WordPress was when they released the Kubrick theme  — I was in AWE of its fancy rounded border with subtle gradient background. I started building sites for churches to fund my education. First for my Master of Arts in Theology at Fuller Theological Seminary and then for my Master of Arts in History at San Diego State University, which of course made perfect sense to go with my Bachelors in Music Education </sarcasm>. Miraculously, I understood web development pretty well. I loved teaching, but I also wanted to get paid and provide for my family. So while I kept studying and paying for my education, I also built sites and earned more. The tipping point happened when I looked into a PhD in History and what that would cost my family compared to taking the offer to build-out the products at WordImpress. I haven’t looked back since. I’m also the Lead Organizer of our Advanced WordPress Meetup in San Diego. We started the Advanced WordPress Facebook group back in 2012 and it now has over 23K members and over 30 admins from all parts of the globe. We recently did the largest WordPress giveaway in history with over $100K in prizes given away to over thirty lucky winners. Our little Facebook group has come a long way in a relatively short time. Through it all, I also blog regularly about Religion, Politics, and WordPress at my personal site . So, what do you want to know? Ask me anything!